Walking is one of the most pleasant and easiest methods to keep slim and fit for life.Here are some of the benefits of walking. Safe exercise: It is the safest aerobic exercise. It does not put much strain on the body and there is no risk like that accompanying high impact workouts like jogging and aerobic dancing. It is therefore recommended even for people who are recovering after surgery. It is also the safest exercise for women before and after pregnancy. It suits all age-groups too. Much convenient: You can choose to walk at any time, late at night, early in the morning at your own convenience. However walking in the afternoons when the sun is too high is not advisable. Low cost: You don’t need any expensive equipment apart from loose fitting comfortable garments and a pair or comfortable sports shoes. Aerobic workout: Regular walking increases the demand for oxygen so that you inhale more air without an effort and use it purposefully. Circulation of the blood and the respiration improve. 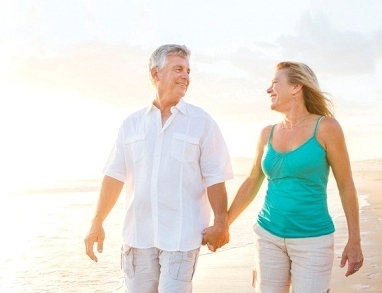 Walking thus acts as a good insurance against cerebral strokes and heart attacks. It also reduces the blood pressure in hypertensive patients. Burns calories: If you are overweight, walking is the ideal exercise because it puts less strain on bones and joints as compared to other aerobic exercises. Brisk rhythmic aerobic walking can pep up your basal metabolic rate and burn up calories. Arrests osteoporosis: Fitness walking stimulates formation of new bone tissues which tend to prevent calcium loss from the bones. This helps prevent osteoporosis, especially in women after menopause. Stress fighter and mood enhancer: A regular fitness walking program relieves you of stress by improving the secretion of neuro hormones, which beat anxiety and depression by giving you a pleasant feeling, while at the same time restoring vitality and promoting a sense of well-being. Reduces skin problems: Women generally suffer from skin-related problems like stretch marks, scars and acne due to rapid slimming, hormonal changes, pregnancy etc. Brisk walking leads to improved blood circulation to affected skin parts. Consequently the skin is cured considerably to become elastic, firm, healthy and free from bulging varicose veins. A woman with walking in her fitness regimen not only looks confident, but also exudes an electric aura. Walking is a wonderful life's pleasure and it adds many years to that life. I walk at least an hour myself. Good thinking time. reduces stress as well. It depends on how you walk. If you're just going for a leisurely walk, then you'll probably only work your calves and hamstrings, but if you're "power-walking," then you'll work all the muscles in your legs, as well as (to a lesser degree) your abs, obliques, and back, because those are the muscles that hold you upright, which is harder to do the faster you're moving. Thus, the faster you walk, the more you'll work out those three parts. If you really get into it and swing your arms, it improves the upper-body aspect of walking. One way to work the whole body out even more is to carry small dumb bells in your hands and swing your arms. Even if you just have five pounds in each hand, it will greatly increase the amount of work your body does. well thanks for sharing these tips. Maintain an upright but comfortable posture, with your neck, upper back, and shoulders relaxed, suggests fitness-walking expert Sara Donovan, author of Mall Walking Madness: Everything You Need to Know to Lose Weight and Have Fun at the Same Time.Minimize the sway in your lower back; don't jut your rear out. Instead, maintain a slight, natural arch in your back. Gently pull in your abdominal muscles. This helps strengthen your abs while reducing lower-back pain. Aim to walk at least five days a week. Every second or third week, add 5 minutes. After about two or three months of regular walking, you should be up to 30 minutes. Once you've hit half an hour, add variety to your terrain rather than increasing time or speed. This will boost your enjoyment, encouraging you to keep up the habit. Walking can do wonders for both body and mind. Learn how to increase the benefits, no matter where and when you walk. THIS ARTICLE WAS WELL INFORMED AND PRACTICAL THANKS WISH ME LUCK.I think that people that are really over weighted should eat healthy food and exercise more often like walking to a friends house and back or like walking to the store without using a vehicle.. well anyways i have to go for a walk.. Bye! Brisk walking for 30-60 minutes per day can make the difference for health and weight loss. Vary your workouts to keep it interesting and challenge your body to boost your metabolism. A brisk walk of 30 minutes daily can do wonders for your health as some people can walk themselves out of depression and anxiety. Walking induces such skills as problem solving and creative thinking. Sorting matters out in your mind when walking seems to happen naturally I find. After a while, walking becomes a kind of meditative period. In addition to lifetime fitness, you also get to escape your everyday busy work life and enjoy the beauty of nature that walking outside allows you to do. I have found the best way to loose calories is not wasting money on the freaking gym and just walking outside around the block and the more you do the more you’ll start to feel better you don’t have to go insane to loose calories just by walking and eating a less proportion size in meals will help and it’s the fat calories your worried about in foods anyway. I do simple yoga and love to walk BUT there is no area where I live that I am not exposed to herbicides and pesticides and therefore have not been able to walk in the warm months for the last two year. This is very frustrating,,,,I'm not getting enough outdoor air or Sun. Walking IS better than doing nothing, but that's about it. If that is the level of health you are aiming at, go for it. However, if you want to achieve anything close to your true potential or vigorous health--not just barely alive--you're going to have to actually bend all those joints through their full range, often against resistance, and do it regularly. You can also get a full body, healthy workout in far less than an hour every day of the week. You can do a circuit program which works every major muscle group either aerobically or strength-building in as little as 22 minutes 3--5 times a week. Walking has immense health benefits and it is the easiest exercise on this planet. All it takes is some commitment to take your first step and then follow it up with 9999 more steps everyday. Nothing beats taking walks with my dog around the countryside here! Exercise on a regular basis…..even if it is just walking around the block each day. Regular exercise improves digestion and elimination, increases endurance and energy levels, and lowers overall blood cholesterol. It also reduces stress and anxiety which are contributing factors to many illnesses and conditions. My favorite is walking and swimming,but I will only swim in the swimming pool. nice post and thanks for sharing the knowledge anyway the overall comments are really impressive, as i am a sports man and to play is my passion so to perform well i usually used to wear the etnies trainers uk and never compromize on it. health, longevity, and one nice a$$!!!!!!!!!!!!!!! Running and walking burn the same amount of calories!!!! Generally a least 30 minutes of continuous exercise a day is considered adequate. An hour would be better if you can do it. Walking is great, try mixing it up with walking in nature, hiking hills, walking up the stairs etc. You will be breathing fresh air and oxygen which is even better for you. Its a great exercise! Walking, as any other exercise, is good for your heart, improving cardiovascular fitness and is good for your mind giving you a “happy” feeling. Walking takes more muscle so it's better for your health. Take a walk each and every day! You can start with 15 min and then building to 45min and then an hour an a half! You will be amazed just how quickly you will see results—not just in your weight loss, but your overall sense of well-being. Regular exercise limits stress and anxiety and there is also the bonus that you could walk in some really beautiful places. Walking is probably the most common form of cardio. People all over the world do it everyday. It is very low-impact and can be done for hours on end, making it perfect for low-intensity, long-duration aerobic training. Fast walking can even get your heart-rate up into the aerobic training zone (70%) if you really push it or walk up hills. This is the form of cardio most often recommended for beginning exercisers, as it is very easy and not stressful to the body at all. Walking shoes can be a good idea if you plan on walking a lot. If you use hand weights while you are walking, be aware that studies have shown no difference in calories burned, strength or bodyfat as compared to people who did not use hand weights. From personal experience, I think walking is the best exercise. It is not strenuous and it can be very enjoyable if you make a habit out of it. I use a pedometer and I aim for at least 10,000 steps everyday. 10,000 steps is the recommended amount. I also hate the gym with all my heart, but once a week I drag my a** in there and lift a couple of weights for 30 minutes, nothing to strenuous. I'm 5'5" and 120lbs and I'd like to think I'm well toned. Regular walking is great for our well being and health. We walk every day to help us get around and by adding some simple steps into your daily routine you quickly see and feel the results. Fast Walking is much more effective and much healthier, running exhausts your body. Walking keeps you in good spirits as when you walk, your body releases endorphins which are responsible for keeping us a happy and joyful mood.